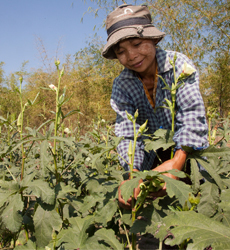 In Myanmar, Oxfam Novib works together with SEARICE and its local partner the Metta Foundation. The SD=HS program conducted a first baseline study in Myanmar and is working on a second study to get insight in the dietary diversity of the target households and coping mechanisms used during different periods. The studies inform the community and program staff on the components of agriculture and food systems existing in communities and the linkages between them, differentiated by gender in terms of access and use.